SiskiyouLiving.com features Ranches, Homes, Commercial, and Land Properties in Central and Northern Siskiyou County of Far Northern California. 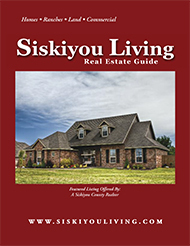 SiskiyouLiving.com includes listings from the towns & cities of Yreka, Montague, KRCE (Klamath River Country Estates), Lake Shastina, Scott Valley, Big Springs, Weed, Mt. Shasta, and unincorporated areas of Siskiyou County. The listings found at SiskiyouLiving.com are from the latest issue of Siskiyou Living Real Estate Guide published & distributed monthly by Quality Advertising in Yreka, California. We're proud to be a part of Siskiyou County California and hope SiskiyouLiving.com helps you find paradise. You can find it here at SiskiyouLiving.com. Please click on the Contact Agent link for more information about a particular listing.